The Carnegie Corporation, among this country's oldest and most important foundations, has underwritten projects ranging from the writings of David Riesman to Sesame Street. Lagemann's lively history focuses on how foundations quietly but effectively use power and private money to influence public policies. Ellen Condliffe Lagemann is professor of history and education at Teachers College, Columbia University. Langemann's history of the Carnegie Cor poration from 1911 to 1982 documents changing social, political, and economic influences on the foundation's liberal ide ology. 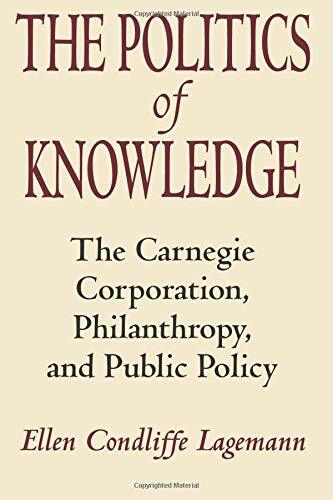 The author reveals the basic dilem ma underlying the philanthrophic "poli tics of knowledge": a tension between the foundation's "mission"--its ideological goals--and its "market"--the targeted benefactors. Libraries, for example, were established on the assumption that they benefited many, but the actual cultural benefits were difficult to prove. Thor oughly researched, this book features several appendixes and a bibliographic es say. Any library selecting this book should also have the author's Private Power for the Public Good (LJ 6/15/83) and Gerald Jonas's The Circuit Riders: Rockefeller Money and the Rise of Mod ern Science (LJ 4/15/89).